As someone whose job involves capturing screen movies, I’m always on the lookout for the Next Great Movie Capture Tool. For years, my tool of choice has been Ambrosia’s Snapz Pro X ( , screenshot-only version, $29; movie version, $69; upgrade, $20), which we discussed in this Gems roundup. Snapz, as good as it is, does have limitations, the largest of which is its need to immediately write captured video out to a .mov file. So after recording a screen movie, you then wait—potentially quite a while depending on the length and settings of your capture—for Snapz to save the movie file to disk before you can capture again. If you’re just working on one segment, this isn’t a huge problem. But if you want to capture 10 or 20 clips for a project, it’s a long cycle of capture, wait for save to disk, then repeat. The other problem with this approach is that typically you record much more footage than you wind up using, so you’re waiting to save data that you’re never going to use. Enter Vara Software’s ScreenFlow ( , $100). 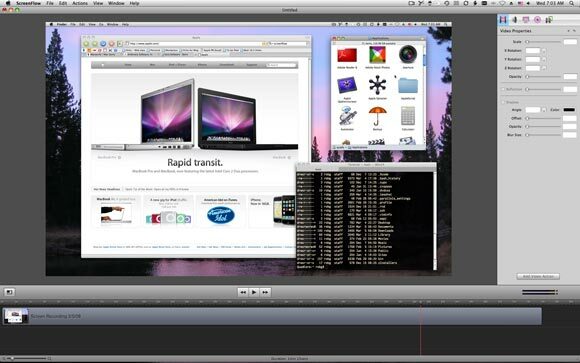 Like Snapz, ScreenFlow can capture video on your screen, including the Mac’s audio track. You can also record audio and video from an iSight camera, which is something that Snapz can’t do. In my testing, ScreenFlow did a great job at capturing even a 1,920-by-1,200 screen with a 3D game running—I couldn’t discern any difference between the ScreenFlow capture and a similar one I created with Snapz Pro. Where ScreenFlow really differs from Snapz, though, is in what happens after you finish your capture. Instead of writing out your capture to a movie file when you stop recording, as Snapz does, captures are instantly opened in something akin to a screen capture editing studio (see below). For those who have used iMovie HD, Final Cut Express, etc., this interface will look somewhat familiar. The recorded clip is displayed at the top left, a timeline appears at the bottom, and the right-side panel contains a number of actions that can be applied to your clip. You can save your work at this point, also without delay. ScreenFlow saves your project as a bundle, so all you’ll see in the Finder is a single (potentially large) file. This file isn’t a usable movie; it’s a project file, containing your captured video and any edits you apply. 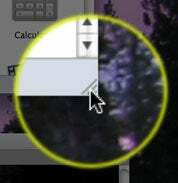 Actions do things such as control the scale, rotation, opacity, reflection, and shadow of your clip (as seen at right), change its volume level, show or hide the mouse in the video (unlike Snapz, the cursor can be enabled or disabled as needed during editing; Snapz either records or doesn’t record the cursor), zoom the mouse cursor, and reveal mouse clicks with both noise and a radar-like visual effect, display keys pressed (including modifier keys) and adding what ScreenFlow calls Callout Actions. Actions can affect the entire clip, or you can set an in point and out point—so you could, for instance, drop the audio level for 10 seconds in the middle of your clip, then bring it back to normal. Or you could scale the screen up to zoom in on one element for a few seconds, and then return to standard size. Rotate an onscreen image 90 degrees, then go back to standard rotation. There’s a great amount of flexibility here, providing great control over how you work on your video. Of all the actions available, though, the Callout Actions section really shows the program’s versatility. 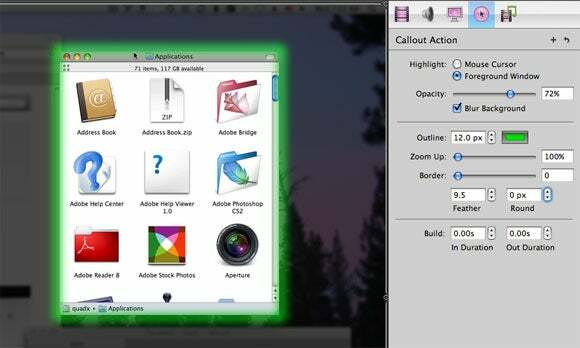 Callout Actions help focus the viewer’s eye on either the active window or the mouse cursor, and they can really help you control what the viewer is looking at. The image at left, for instance, shows a “zoom circle” around the mouse cursor that’s been given a slight feather and a yellow border. There’s no way a viewer will miss this when watching your movie. Callout actions can even build in and out, so they appear and disappear gracefully; putting everything together, you get something like this movie (964KB). Doing effects such as these in Final Cut Express or iMovie HD (especially for someone who’s not a pro at such things) is somewhere between very difficult and impossible; in ScreenFlow, it took about ten seconds to create that effect. Again, this took almost no time to create, and definitely shows the viewer what portion of the screen to watch. Even more interesting, though, is ScreenFlow’s ability to zoom just the active window, instead of the entire screen. If you really want the viewer to see something, this is a great tool to put that window front-and-center in the frame. I created a short demo movie (2.2MB) showing this effect—notice how the screen itself isn’t zooming, just the frontmost window. Beyond the actions, you’ll also find some standard video editing tools, such as the ability to split a clip (though not merge clips), trim clips, and mark in and out points. Once you’re done with all your basic editing, you’ll want to export the finished result to a QuickTime movie file, for use in other applications. ScreenFlow offers a number of presets targeted at web distribution, as well as a Customize button that gives you access to all of the standard QuickTime controls over settings, filters, and size. Using the presets, the end results were about what I would expect—Web High (Best Quality) looked great, while Web Low looked…passable. Using the Customize option, though, you can create whatever mix of quality and file size you desire. While ScreenFlow is amazing in what it does, there are some things it doesn’t do that will hopefully be addressed in future releases. One of the main problems is that ScreenFlow always captures the entire screen. When working on a video, though, you’re usually more interested in a certain window or region of the screen. 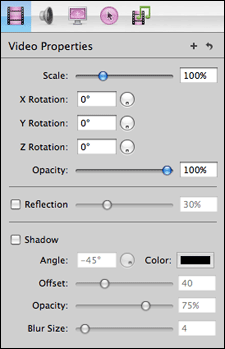 ScreenFlow does offer a cropping tool, so you can trim the clip down to the desired size. However, you can’t specify an exact size or ratio, making it harder to get the exact 640-by-480 size you’ll need, for instance, for a clip that’s going to be mixed with DV footage. While ScreenFlow will record the microphone input when you capture your movie, there’s no voiceover tool in the editing suite. While some people like to record their audio track during capture, I prefer to do so after I’ve made my edits, so I know exactly what footage is being used in each clip. Given ScreenFlow’s ability to lower the volume level of the background track, adding a voiceover tool seems like a natural fit. Finally, while the provided tools are very nice, they left me hoping for even more. In the current release, you can’t add titles, free form text, transitions, special effects, or objects such as boxes and circles to your video—so that means that you’ll still need to export your movie and open it in a “real” video editor to add such details. If these missing tools were present, then ScreenFlow really could serve as a complete screen capture studio. Even allowing for some of the missing but desired features, ScreenFlow is a great start for a version 1.0 application. In fact, I’ve already put it to use in my workflow—you’ll probably see some of its abilities in my next Macworld video blog. At $99, it’s not inexpensive, but if you do a lot with screen captures, it’s well worth the investment. ScreenFlow 1.0.2 requires Mac OS 10.5 (Leopard).